While adversaries argued in front of the U.S. Supreme Court last week, 79 people who once worked at St. James Hospital in Newark watched the clock. Their pension fund would go belly up in less than a month. The money was almost gone. They would lose retirement income that was promised for a lifetime. And no one is taking responsibility. But the case being decided by the highest court in the land could give new hope to the pensioners, including Josephine Trimarco, 74. Trimarco, like other retirees, received a letter in November saying their pension fund would be out of money next month. Those who hadn’t started taking benefits never received any notification, retirees said. 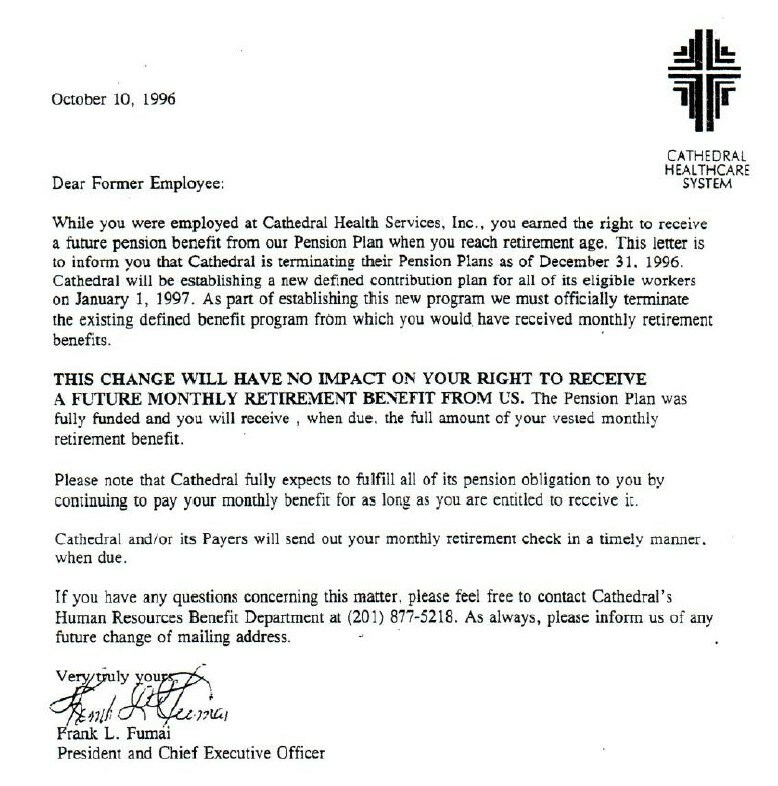 This all started decades ago, when St. James and other Catholic hospitals petitioned the IRS to change the status of their pension plans to so-called “church” plans. This would mean the pensions would no longer have to follow federal rules that required them to purchase insurance to guarantee the pensions — even though plans had been subject to the rules for since their inception. Because the St. James plan no longer had to adhere to federal protections, the plan is almost broke, and the safety net that would have been there under federal rules doesn’t exist. When the payments stop, Trimarco will lose half of her retirement income. It looks like that security will be gone — unless the Supreme Court decides in pensioners’ favor. The Supreme Court heard arguments from attorneys representing pensioners from three other Catholic hospitals — including St. Peter’s University Hospital in New Brunswick — debating whether the hospitals’ pension plans should have remained subject to the federal pension rules. Previously, the employees argued in separate lawsuits in three states that the hospitals’ pensions should not be considered “church” plans because while they were affiliated with churches, they were not, in essence, religious institutions. Those lower courts agreed, saying the hospital plans should be subject to the federal rules and therefore, protected. But the hospitals took the fight to the Supreme Court, and the decision should come before the end of the current session in late June. If the justices vote in favor of the pensioners, their individual lawsuits against the Catholic hospitals can continue. “It’s a toss-up,” said Karen Ferguson, director of the Pension Rights Center, who was at the court last week. She said the justices seemed less concerned with the devastating impact the ruling could have on retirees, who have worked a lifetime counting on a guaranteed pension. Instead, she said, the court focused on statutory interpretation and the history of such IRS rulings. “They didn’t seem to realize these hospitals had for decades complied with the federal pension law,” she said, noting that changes to “church” plans only came after consultants showed hospitals how much money they could save by no longer paying for federal pension insurance. The decision would have reach beyond Catholic hospitals, impacting organizations of all faiths, from Jewish social services agencies to Protestant educational organizations, Ferguson said. Attorneys for the retirees told the court as many as 1 million pensioners could be impacted by the court’s decision. With only eight justices on the court, if there’s a tie, the decision would ultimately favor the pensioners because the lower court rulings that the plans should not be “church” plans would stand. That would give ammunition to the St. James pensioners. But, Ferguson said, if Neil Gorsuch is confirmed by the Senate and takes the empty court seat before the current session ends, the hospitals could ask for re-argument. Whatever the court decides, the St. James folks have a long road ahead. That’s because St. James itself was sold several times, and all the parties say they never took on the hospital’s pension liabilities. CHE later merged with Trinity Health, and eventually, Trinity sold St. Michael’s to Prime Healthcare. When Bamboozled tried to nail down who had the pension obligation, the archdiocese said it wasn’t responsible, and the pension obligation wasn’t included in the 2008 deal. Trimarco, the St. James retiree, said she contacted the Newark archdiocese after she learned the pension would fail, but that was before Newark’s new archbishop, Cardinal Joseph Tobin, was installed. “They didn’t want to take responsibility,” she said. Ann Ciriello, an 86-year-old widow who worked at St. James for 32 years, said she hoped Tobin would listen. “It’s an injustice to us all,” Ciriello said. Charles Brennan, the former president and CEO of St. James, wrote to Tobin in December 2016. No one responded to his letter. 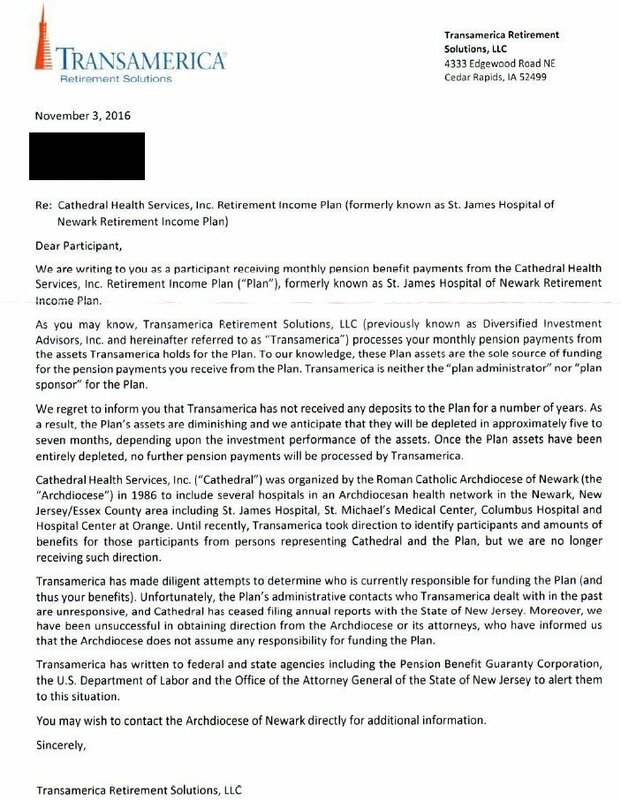 Nor did the archdiocese respond to a letter by St. James’ former chief financial officer Rich Salvia, a 17-year St. James vet. Salvia said even if the plan maintains “church” plan status, someone should be on the hook for the pension. 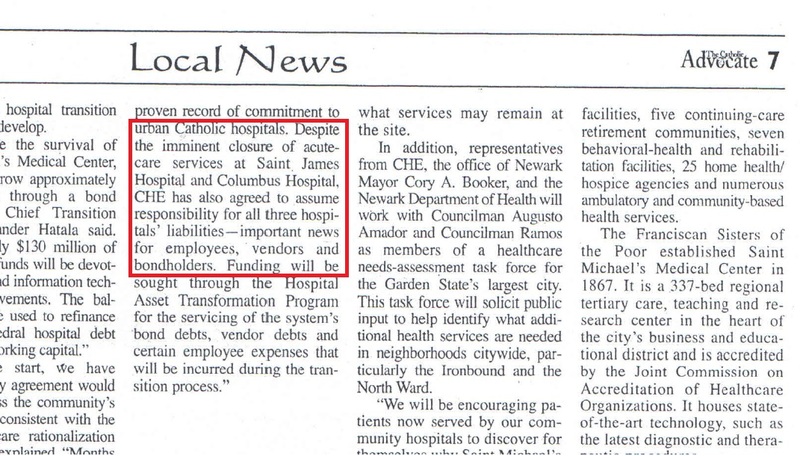 The letter also said the plan was fully funded. Back then, Salvia suggested in writing that plan trustees either purchase annuities for each vested pensioner or offer them a lump sum benefit. Apparently, the trustees didn’t think it was “prudent.” Now the fund is almost broke. So to Salvia, “church” plan status doesn’t really matter. “What matters is responsibility and in 1996 the plan was fully funded,” he said. Salvia is spearheading a campaign to present retiree complaints to the Attorney General’s office, with more than 30 people on board so far. He’s actively seeking others, and legal action is being considered, he said. Newark archdiocese spokesman Jim Goodness didn’t respond to our requests for comment. In the meantime, the retirees will have to make due. Trimarco said knowing the pension will end has already changed her lifestyle and spending habits.